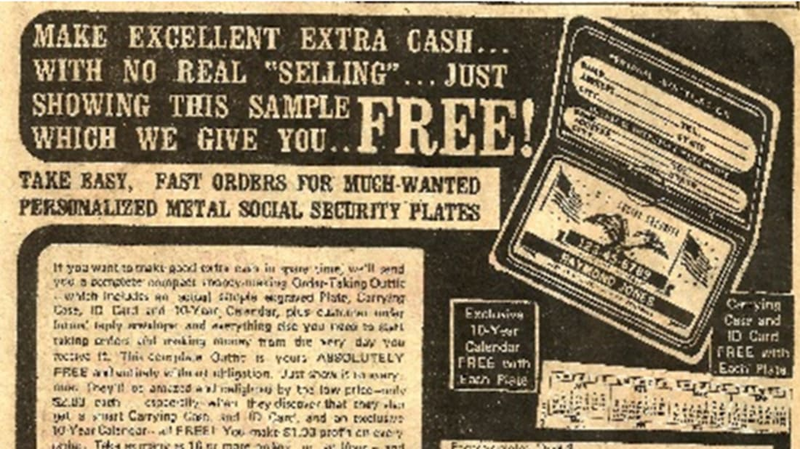 A lot of ads in old comic books just wanted your money. You send in the cash; you get the low-quality novelty toy that will teach you an important lesson about trusting anyone who purports to sell you alien technology that can see through ladies' clothes. But there were other ads in those old comic books, placed by companies who wanted you to give them other people’s money. All you had to do was hit the pavement and sell their products door to door. In return you’d get money, prizes, and a start in the business world. Usually. Engravaplate maintained its 1972 trademark an impressively long time for a third-person novelty sales object, until 1995. And they didn't limit their sales pool to adolescents, putting much simpler ads in Field & Stream, Popular Mechanics, and Ebony magazines. Just show the cards. And be prepared, as avarice and desire cloud the faces of your loved ones while they whisper in dry voices, “I must have them,” pushing cash and heirloom jewelry into your hands. Sign me up! *We will not give you any money. Oh, Sunshine Studios Inc., you are a crafty minx. 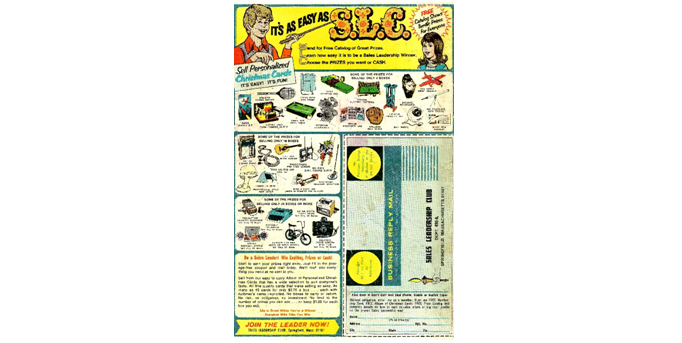 You were the parent company of many “children-shilling-stationery” programs under many names, including the Sales Leadership Club, a popular way for kids to try to earn awesome prizes clear into the '90s. Again, the game was selling personalized Christmas cards, but a slightly different twist was used to lure the younger readers of Boris Karloff’s Tales of Mystery and Boys' Life. Forget the cash. Look at the STUFF! Whatever your penchant, you can earn enough money to indulge it, from rocket kits to professional-style hair dryers. And, even more delightfully, SLC was totally on the level, and remained a member of the Better Business Bureau from the '50s to the '90s. With a little hustle, you really stood a chance of winning that Deluxe Two Band Radio. As a fervent student of history, it leaves me gob smacked that I had never heard of Grit. Because when they tell their potential salesboys that they are America’s Greatest Family Newspaper, they weren’t flim-flamming. Grit was founded by a German immigrant named Dietrick Lamade in 1885. That fact alone isn’t so surprising until it is combined with the fact the Grit still exists! Both online and in published form, it enjoys a hearty circulation among American’s rural inhabitants, as it has for nearly 130 years. Entrepreneurship wasn’t the only challenge the Lamades offered the young men of America; one of Lamade’s sons was a top executive in the Little League Baseball association. The Lamades contributed liberally to making Little League a national institution, which in turn gave them a healthy pool of recruits to sell their newspaper to its intended small town readers. 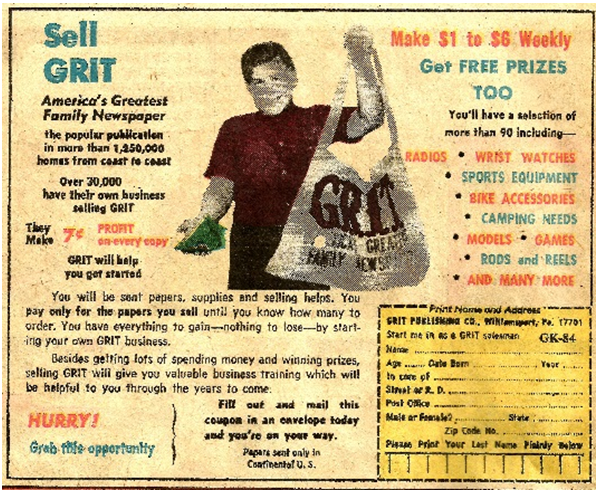 Grit was very popular; one reason was because it was not a “real” newspaper. It was Lamade’s business practice to never include any news that would depress or drain hope from his readers, and his pages were packed with comics, stories, and amusing human interest, with a special focus on rural living. Seven cents profit per copy might have not been a bad deal for such a well-received product. Gather round and hear the tale of an American tragedy. 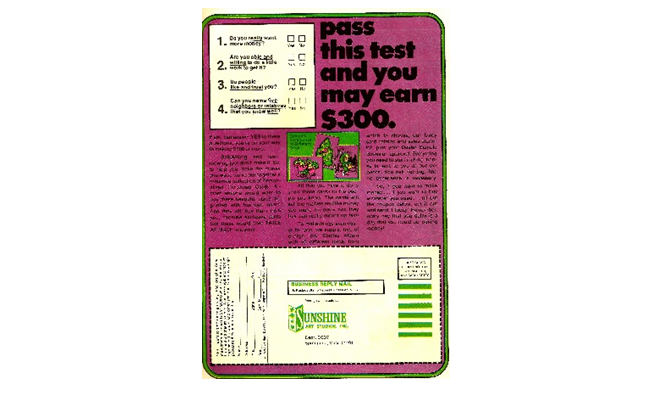 So … did YOU sell American Seed Company seed packets in your neighborhood when you were young? If so, perhaps you are one of the guilty. The American Seed Company operated a business dynamic with its adolescent salespeople that, while seeming quite unsound by today’s standards, served them well for decades. The child would send in for the seed packs, sell them, send back all the money, and earn a nice prize, like a badminton set, or a pocket calculator. But between 1975 and 1981, 400,000 children sent away for seed packages and never sent any money back. Because why should they? They could just keep the money, and The American Seed Company could go pound salt. So, in 1981, the company went out of business, bilked out of existence by the earliest tides of a cynical, grungy Generation X.
Oh sure, it’s greeting cards again. But if the Facebook fan page is any judge, Olympic treated their little minions pretty well. 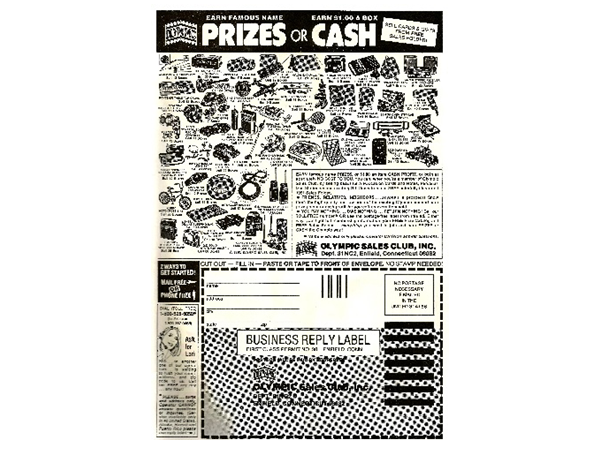 They advertised more and better prizes than their competitors, filling every square inch of ad space they could spare with drawings of (often name brand) loot, from Huffy Motocross Bikes (sell 64 boxes of cards) to the Deluxe Uno Card Game (just 7 boxes!). Eventually, Olympic Sales became Olympia Sales, and according to Kelly, who answered the phone at Olympia, they stopped having kids selling door to door around seven years ago: “It’s just the age we live in, you know? No one wants their kids selling door to door.” Olympia still produces cards, but now only for wholesale to distributors. There is good news for the parents and grandparents who successfully earned Pink Panther Radios and Kodak Instant Cameras, and wish their own progeny could have the same experience. Kelly hinted that Olympia might be considering bringing back a form of kid-driven distribution in the future, via internet, which would make it the only sales scheme on our list to keep enterprising kids on the payroll.